Anhui ▶ (Chinese: 安徽; pinyin: Ānhuī; Wade-Giles: An-hui; Postal map spelling: Ngan-hui, Anhwei or An-hwei) is a province of the People's Republic of China. It is located in eastern China, and it stretches across the basins of the Yangtze River and the Huaihe River. It borders Jiangsu to the east, Zhejiang to the southeast, Jiangxi to the south, Hubei to the southwest, Henan to the northwest, and Shandong for a tiny section in the north. The provincial capital city is Hefei. The name "Anhui" derives from the names of two cities in south Anhui, Anqing and Huizhou (which is now Huangshan City). The abbreviation for Anhui is "Wan," because there was historically a State of Wan, a Mount Wan, and a Wan river located in the province. Anhui, although formally a separate province from the seventeenth century, has a history that provides a cross section of China's history. The Yangtze River runs through the provinces, with the ancient cities and provinces that have grown up over the past 7,000 years. Governed by almost every major dynasty that has ruled China, Anhui has experienced the disturbances of nomadic tribes invading periodically. Enjoying abundant energy resources, located in a beautiful natural setting, experiencing an improving per capita income, Anhui has been contributing to China's modernization program. 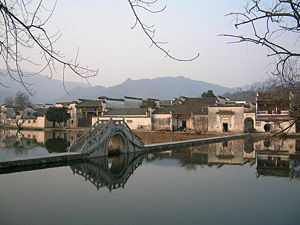 The province of Anhui was formed in the seventeenth century. Before then, there was no coherent concept of "Anhui." Northern Anhui was firmly a part of the North China Plain in terms of culture together with modern-day Henan province. Central Anhui constituted most of the fertile and densely-populated Huai He River watershed. Southern Anhui, along the Yangtze, was closer to Hubei and southern Jiangsu provinces in culture. In addition, the hills of southeastern Anhui formed a unique and distinct cultural sphere of its own. Even with the creation of the modern day province however, these various cultural distinctions have not been eroded. From the Shang Dynasty (sixteenth to roughly eleventh century B.C.E.) most of Anhui was populated by non-Sinitic peoples known collectively as the Dongyi. 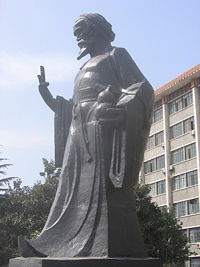 King Tang of Shang, the legendary founder of the Shang Dynasty, was said to have placed his capital at Bo (亳), in the vicinities of Bozhou in modern northern Anhui. During the Warring States Period, Shouchun (currently Shou County) in central Anhui became a refugee capital for the state of Chu after its heartlands in modern day Hubeiprovince was overrun by the powerful state of Qin in the west in 278 B.C.E. Qin nevertheless managed to conquer all of China in 221 B.C.E., creating the Qin Dynasty. Anhui was administered under several different commanderies during the Qin Dynasty and the subsequent Han Dynasty. Near the end of the Han Dynasty, Shouchun became the base for the warlord Yuan Shu, who declared himself emperor at one point, but soon succumbed to illness, allowing his small realm to come under the powerful warlord Cao Cao, founder of the Wei Kingdom, one of the Three Kingdoms. The fourth century saw the influx of nomadic tribes from Central Asia into North China. This began several centuries of political division of northern and southern China. Being at the juncture of north and south, the lands comprising modern Anhui changed hands frequently and were usually bisected through the middle politically. The Battle of Feishui, between the Former Qin of the north and the Eastern Jin Dynasty of the south, took place in 383 in modern Anhui. The Sui Dynasty (581-618) and the Tang Dynasty (618-907) oversaw several centuries of relative peace and unity in China. During this period, Anhui was once again ruled under several different jurisdictions. During the division of China between the Jin Dynasty in the north and the Southern Song Dynasty in the south, Anhui was once again bisected, this time along the Huai He River. This partition lasted until the Mongol reunification of China in 1279. In 1368, the Ming Dynasty drove out the Mongols. Due to a short stint as the capital of China by the city of Nanjing in nearby Jiangsu province, the entirety of Jiangsu and Anhui were given special status as territories governed directly by the central government, and were called Nanzhili (南直隸 "Southern directly-governed"). The Manchu Qing Dynasty, which conquered China in 1644, changed this situation by establishing Nanzhili as Jiangnan province. In 1666, Jiangsu and Anhui were split apart into separate provinces, which provided the borders that currently make up modern Anhui province. The sole significant change that has occurred since that time has been the move of the provincial capital from Anqing to Hefei in 1946. However, when the People's Republic of China was founded in 1949, Anhui was briefly split into two separate administrative regions: Wanbei (North Anhui) and Wannan (South Anhui). These two regions were re-merged to form the modern province of Anhui in 1952. Anhui is quite diverse topographically, but generally speaking it can be divided into five topographical zones: plains north of Huaihe River, hilly lands between the Huaihe and Yangtze Rivers, mountainous areas in western Anhui, plains along the Yangtze River, and hilly areas in southern Anhui. The north of the province is part of the North China Plain, while the north-central areas are part of the Huaihe River watershed. Both of these regions are very flat and densely populated. The land becomes more uneven further south, with the Dabie Mountains occupying much of southwestern Anhui and a series of hills and ranges cutting through southeastern Anhui. The Yangtze River finds its way through south Anhui in between these two mountainous regions. The highest peak in Anhui is Lotus Peak, part of the Huangshan Mountains in southeastern Anhui. It has an altitude of 1873 m.
Major rivers in the province include the Huaihe River in the north and the Yangtze in the south. The largest lake is Lake Chao in the center of the province, with an area of about 800 km². The southeastern part of the province near the Yangtze River has many lakes as well. As with topography, the province differs in climate from north to south. The north is more temperate and has more clearcut seasons. January temperatures average at around -1 to 2°C north of the Huaihe, and 0 to 3°C south of the Huaihe; in July temperatures average 27°C or above. Plum rains occur in June and July and may cause flooding. Daxiong Baodian (literally, "Treasure Hall of the Great Hero") at Jiuhuashan, a mountain in China's Anhui province considered sacred to Buddhists. The seventeen prefecture-level divisions of Anhui are subdivided into 105 county-level divisions (44 districts, five county-level cities, and 56 counties). Those are in turn divided into 1845 township-level divisions (972 towns, 634 townships, nine ethnic townships, and 230 subdistricts). See List of administrative divisions of Anhui for a complete list of county-level divisions. 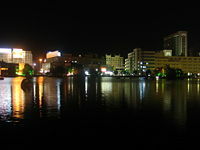 Downtown Wuhu (Anhui province, P.R.China), view around Mirror Lake at night. Agriculture in Anhui varies according to the climate zones that the province crosses. North of the Huai He River, wheat and sweet potatoes are grown, while south of the Huai He River mostly rice and wheat is grown. Many of Anhui's agricultural products are famous both at home and abroad, including: grapes, pears, pomegranates, green tea (Huang Shan), and black tea (Keemum). In addition, Anhui is well-known for its animals and livestock, including: crab, bulls, Fuyang yellow cows, Dingyuan pigs, silver fish (Chaohu lake), and white geese of Luan. Natural resources of Anhui include iron in Ma'anshan, coal in Huainan, and copper in Tongling. Along with the existence of these raw resources, there are also several industries related to them throughout the province. (e.g. steel industry at Ma'anshan). One of the most famous Anhui-based corporations is the automobile company Chery, which is based in Wuhu. Anhui is a prominent energy supply base for eastern China. The coal fields in Huainan and Huaibei, with an annual output of 46.777 million tons, are the largest producers of coal in southern China. The power generating capacity of the province is 31.93 billion kilowatts. Compared to its more successful neighbors to the east, Zhejiang and Jiangsu, Anhui has lagged markedly behind in economic development with a GDP per capita around one third the level of those two provinces. There is also great regional disparity within the province itself, and most of the wealth is concentrated in the industrial regions close to the Yangtze River, such as Hefei, Wuhu, and Ma'anshan. Anhui's nominal GDP for 2004 was approximately 481.3 billion yuan (60.1 billion USD) and a per capita of 7450 yuan (930 USD). It is considered a mid-size economy in terms of economic output. 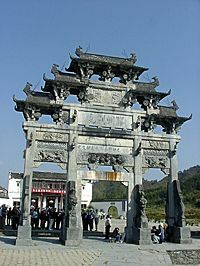 Anhui spans many geographical and cultural regions. The northern, flatter parts of the province, along the river Huai He and further north, are most akin to neighboring provinces like Henan and Shandong. In contrast, the southern, hilly parts of the province are more similar in culture and dialect to other southern, hilly provinces, like Zhejiang and Jiangxi. Han Chinese make up the vast majority of the population. The She and Hui nationalities are the two largest minority groups, but there also 52 other ethnic groups, including the Man and Zhuang peoples. Hongcun village, in Anhui province, China. Mandarin dialects are spoken over the northern and central parts of the province. Dialects to the north (e.g. Bengbu dialect) are classified as Zhongyuan Mandarin, together with dialects in provinces such as Henan and Shandong; dialects in the central parts (e.g. Hefei dialect) are classified as Jianghuai Mandarin, together with dialects in the central parts of neighboring Jiangsu province. 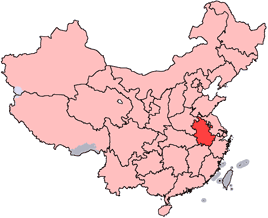 Non-Mandarin dialects are spoken in the south: dialects of Wu are spoken in Xuancheng prefecture-level city, though these are rapidly being replaced by Jianghuai Mandarin; dialects of Gan are spoken in a few counties in the southwest bordering Jiangxi province; and the Hui dialects are spoken in about ten counties in the far south, a small but highly diverse and unique group of Chinese dialects. Huangmeixi, which originated in the environs of Anqing in southwestern Anhui, is a form of traditional Chinese opera popular across China. Huiju, a form of traditional opera originating in the Hui-speaking areas of southern Anhui, is one of the major precursors of Beijing Opera; in the 1950s Huiju (which had disappeared) was revived. Luju is a type of traditional opera found across central Anhui, from east to west. Anhui cuisine is one of the eight great traditions of Chinese cuisine. Combining elements of cooking from northern Anhui, south-central Anhui, and the Hui-speaking areas of southern Anhui, Anhui cuisine is known for its use of wild game, including Luzhou Roast Duck, stewed soft-shell turtles, and braised pigeon, served with fresh ingredients. Seafood and fish are often kept alive right up until cooking time, to ensure the best flavor and freshness. Sesame cakes are a specialty. Use of mushrooms, bamboo shoots and Chinese herbs are common in many Anhui dishes, which are slightly salty but not excessively hot like Sichuan, they are sometimes flavored with sausages or ham, using comparatively simple methods of preparation. Anhui has a high concentration of traditional products related to calligraphy: Xuanzhou (today Xuancheng) and Huizhou (today Huangshan City) are revered for producing Xuan Paper and Hui Ink, respectively, which are traditionally considered the best types of paper and ink for Chinese calligraphy. She County is famous for the She Inkstone, one of the most preferred types of inkstones (a required tool in traditional calligraphy). Bamboo brushes, ink, instones and paper together are known since ancient times as the "four treasures." At the end of 2000, Anhui Province had 42 institutes of higher education, with 182,400 students and 15,100 teachers. Along with this the province had 4,621 junior and senior high schools with 4.228 million students and 186,300 teachers. Enrollment in the province's 24,281 primary schools totaled 6.44 million students with 273,700 teachers. Anhui has an abundance of tourism resources, including Mount Huangshan, which is famous for its towering pines, precipitous stones, sea of clouds, and hot springs. 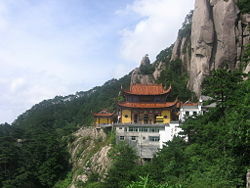 Mount Jiuhua, one of the four famous Buddhist Mountains in China, and Mount Tianzhu are also well known scenic spots. Along with these natural sites, Anhui is well-known for the ancient villages in the south of the province, including Xidi and Hongcun, which was named a World Heritage Site. Anhui is also well known for its various craftworks, such as rice paper, ink stone and Chinese ink. This page was last modified on 22 March 2016, at 14:58.